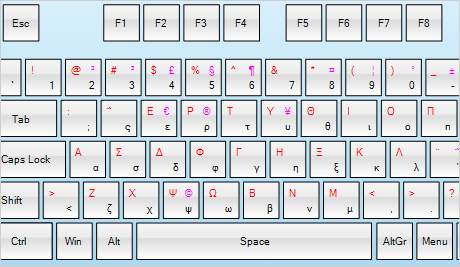 A fully-functional on-screen keyboard suitable for every WinForms application. Create a next-generation WinForms application that provides users with a feature-complete touch keyboard in compelling design. Enjoy the large set of built-in keyboard layouts, themes and extensive API documentation to implement the control in short time and achieve fantastic results. The virtual keyboard control provides everything you'll ever need to render a keyboard of any type in a POS UI WinForms software. The control supports regular keys, special and num pad keys. You can also use extended keys, which let you easily create a sequence of keystrokes. Each key exposes a line of properties that let you change its location and appearance for the best possible keyboard result and user accessibility. The smart virtual keyboard fully emulates a physical keyboard in user interaction - when a modifier key is pressed the control does not react till a regular key stroke is received. Experience the freedom to create WinForms applications for touch terminals that demand Kiosk UI without the need to track and change the input language manually - MindFusion virtual keyboard does it for you. The control features an impressive list of more than 100 predefined languages with the right keyboard layout. Moreover, you have the built-in Keyboard Creator tool, which provides a convenient UI when you want to build a special type of keyboard with unconventional key location or language symbols. Once you are done, you can save the new keyboard for later use in future projects that require text input in keyboardless environment. The full support of themes and the ability to completely customize the appearance guarantee your virtual keyboard will complement the style and color of the WinForms application it is part of. Besides a collection of the popular office themes, you have the ability to create custom themes in XML which target precisely the looks of your current software, The control offers the full range of appearance properties need to fine-tune the smallest detail of the keyboard.